Hi, a have a couple of logarithmic faders i would like to hook upp to controll the volume of axoloti (not in software), meybe even 4, right out, left out and right in, left in, how should i do this? You'll need VDDA, GND and four analog ports. "This is for hack-ability : you could split out stereo into dual mono, or convert the line input jack into an expression pedal input, or perhaps add an volume potentiometer to the line output, or in stompboxes some people require a true bypass..."
I haven't tested this, but should be fine. I recommend log-taper potentiometers or faders, suggested value 470Ohm to 10kOhm. 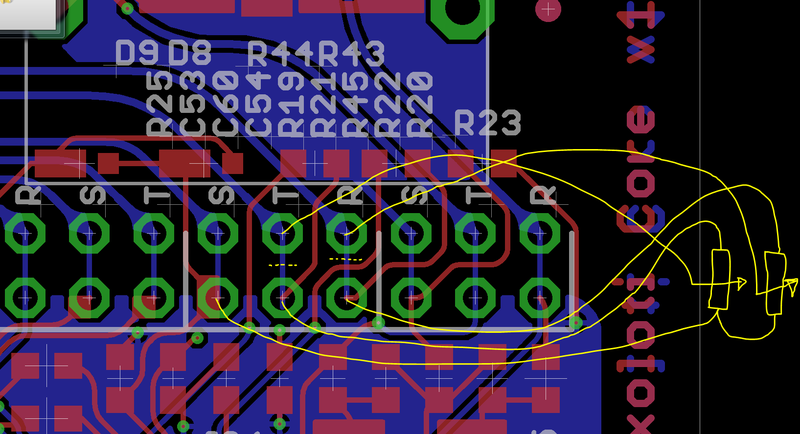 You have to cut two tracks on the bottom side of the circuit board, marked with a yellow dotted line. 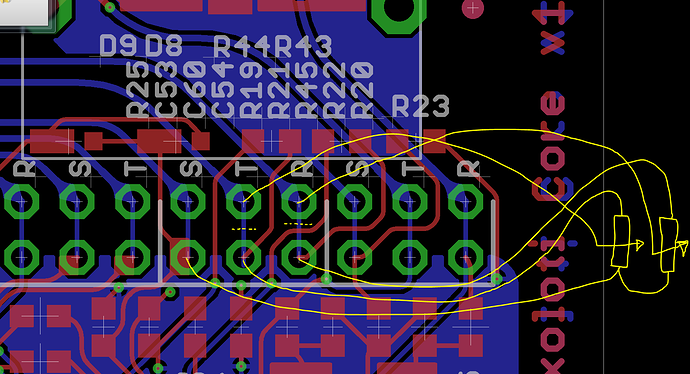 I'll make a separate drawing for line input level potentiometers. That looks clear to me! i guess to ground connection is the "S" connection, and the arrow on the yellow lines symbolises the input? gonna post a pic and the results when i'm done. Yes, "S" is sleeve, "T" tip, "R" ring. Arrow on the potentiometer is the middle terminal. Thank you, the volume faders are working now, but i get a vary drastic volume increase the last bit of the fader, im using 10k Ohm log faders. Yeah, i figured that late last night, thanks tough! feel a bit stupid hehe. Would you be so kind drawing me these?